Characterized by an ivory background, it features hazelnut coloured fragments and pearlescent details. Kone Gypsum by Atlas Plan is the ideal choice for modern furnishing solutions, which are eloquently summed up in its colours and linear geometric designs. The slabs come in a 162x324 cm size with a thickness of 12 mm and are available in a matte finish. Recommended for covering tables, islands, kitchen worktops and backsplashes, ventilated façades, bathroom vanity units and bar and restaurant counters. 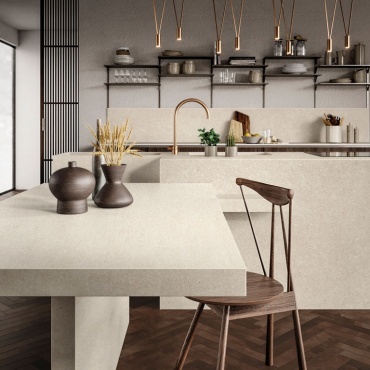 Kone Gypsum Habitat: Kone Gypsum matt slabs are paired with Dwell Brown Leather Herringbone by Atlas Concorde for the floor and a set of objects and furnishing accessories with strong overtones of industrial design. The effect produced by the contrasting colours and materials is that of exquisite contemporary elegance.